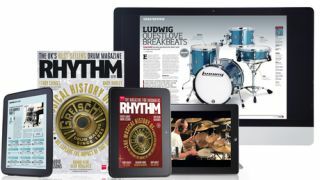 Rhythm, the magazine for drummers, is available in a number of different formats to suit every type of reader. See the options below to find out where to buy and the best format for you. In most cases you can also view samples issues to try before you buy. Click here to pick up the latest issue, selected back issues and to check out current subscription offers. Rhythm is also available to purchase from all good magazine/book stores and supermarkets. You can read Rhythm, enhanced with video and audio, for these Apple devices. Search for 'Rhythm Magazine' on the App Store or tap here direct from your device to view available issues, special editions and subscription offers. Read the video and audio enhanced version of Rhythm on your Kindle or Kindle Fire HD by clicking here. Android users can read Rhythm via Google Play. Finally, you can also read Rhythm digitally on your Mac or PC. Head to www.zinio.com to see the latest offers.